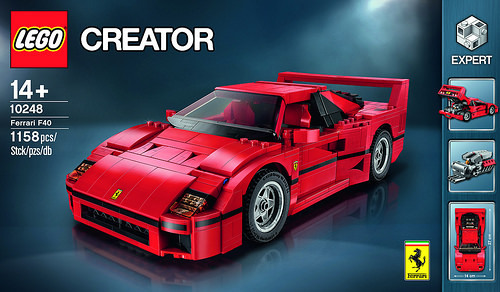 LEGO has just announced the next large Creator vehicle, a Ferrari F40. This supercar follows in the line of popular models such as the still-currently available Volkswagen Camper Van and Mini Cooper, and the now-retired Volkswagen Beetle. 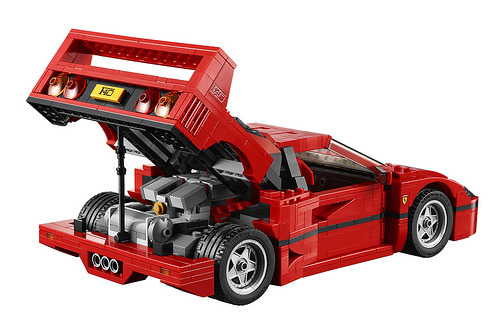 10248 Ferrari F40 has 1,158 pieces, and will retail for USD 89.99, EUR 89.99, GBP 69.99, and DKK 799.00, and will be available starting August 1. The official press release is below the jump. The dream of owning your very own Ferrari F40 super sports car turns real with the highly detailed LEGO set One of the most desirable sports cars of all time, the Ferrari F40, is now appearing for the first time as a LEGO product; available from 1 August 2015 online from the LEGO.com/shop, as well as in the 13 LEGO stores in Germany and Austria. The LEGO Ferrari F40 is 8 cm tall, 27 cm long and 14 cm wide. LEGO has also released an interview with the designer, Mike Psiaki. Mike may be known to some of you, having earned his stripes as a fan builder before transitioning to designing for LEGO. Michael Psiaki is the designer of the LEGO Ferrari F40. In this interview he talks about details and challenges while creating this super sports car. 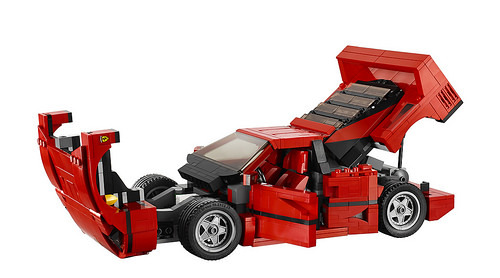 Did the sharp lines of the F40 make it an easy car to recreate with LEGO bricks? Actually, the more I worked on this model the more I noticed how many subtle curves there are in the car. The car gets slightly wider and taller as you move towards the back. We managed to pull this off with a clever angled section just behind the doors. It also allowed us to get a really small gap in the frame when the doors close. Where is the spare wheel? On the real F40 there’s a compartment under the hood that looks like it should fit an extra wheel in it, but it’s actually too small. Instead there is a can of spray that can be used to patch any flat tires. Just like the real car, the compartment on the LEGO model is too small for a wheel, so we also included the can of spray. What is one of the more interesting parts used in the model that we can’t see in the images? There is a tooth element used twice inside the hood of the car to provide a stop for the headlights. It fits perfectly around the wheel and provides just the right stop so the pop-up headlights rest at the correct angle when they are closed. Where are the door handles? The F40 was designed as a very light weight car, door handles were too heavy. Inside each door on the LEGO model you can see some bars that represent a cable on the car that would be pulled to open the door from the inside. What is your favorite part of the model? The front hood of the car. It has two built air intakes and is attached at an angle to the rest of the model. It was very tricky to figure out how to get that section built correctly and I was very proud that we found a way to build the air intakes from standard LEGO elements. What was the most challenging part of the model to design? The F40 has two opening panels, the engine cover and the front hood, they’re very large moving sections of the car and they were definitely the hardest sections to figure out how to make strong and look good at the same time. There’s a lot of advanced building techniques to make it all come together seamlessly. You can see all of the photos of the new Ferrari F40 here. Can anyone recall another official set that had so few studs visible, that wasn’t a Technic product? I thunk the Mini Cooper has even fewer studs.